n early June 2017 Malcolm Turnbull gave the keynote speech at a big defence conference in Singapore. He warned of China’s ambition to become the region’s leading power, and called on America and its friends and allies in Asia to block this ambition and preserve the old US-led regional order. This was the first time an Australian prime minister had plainly acknowledged the strategic rivalry between China and America, which was long overdue. But Turnbull expressed great confidence that America would prevail over China, and that Asia would therefore continue to flourish under US leadership. So the Australian government is still a long way from acknowledging, to the rest of us or even to itself, what is really happening between America and China, and what it will mean for Australia. This has become something of a mantra, intoned by leaders on both sides of politics whenever the question of US–China relations comes up. Malcolm Turnbull even repeated it in his Singapore speech, though he’d made it perfectly clear why it was wrong. It is a perfect example of the very human tendency to confuse a wish with a fact. It is certainly true that Australia doesn’t want to choose between America and China. Our whole vision of Australia’s future assumes that we can avoid such a choice, so that we can keep relying on China to make us rich while America keeps us safe. But in recent years, as the rivalry has escalated, we have more and more faced important choices about when to support America and when to stay on the sidelines. We have not so far been forced to make an all-or-nothing choice to side with one and abandon the other, but that could come if the rivalry escalates further. And if America steps back from Asia, the question of Australia’s choices becomes irrelevant. We won’t have a choice, because America will no longer be there for us to choose. But, false or not, the “we don’t have to choose” mantra reveals Canberra’s assumptions about Australia’s future. If we won’t have to choose between America and China, it can only be because they are not serious strategic rivals, and if they are not serious strategic rivals, it can only mean that China has decided not to challenge America for regional leadership, because it lacks either the power or the resolve to do so. Canberra, then, is making the same mistake as Washington: it is underestimating China’s strength and overestimating America’s. That is the story we are telling ourselves to avoid facing what’s really happening. The pattern is clear. Under successive governments since 2011, Canberra has offered strong rhetorical support to America’s leadership in Asia, but has refused to do anything practical which can unambiguously be seen as directed against China. Our aim throughout has been to convince Washington that we are supporting it against China, and to convince Beijing that we are not. It is, in other words, a policy of systematic duplicity. Some might say that such duplicity is unavoidable and even admirable when one is walking a diplomatic tightrope, but that is only true if the duplicity works. Our problem is that it isn’t working: we are fooling no one, except perhaps ourselves. Certainly the leaders in Beijing are not fooled, but nor are they displeased. They don’t expect us to support them against the United States. They just want to us not to support the US against them – to turn us into a neutral. That is a big win for them, because we are America’s oldest and closest ally in Asia. They therefore tolerate our lip-service to the alliance so long as we don’t give America any tangible or significant support. So far they are getting what they want, so we haven’t been punished. Gillard, Abbott and Turnbull have all avoided doing anything that Beijing has seen as violating Howard’s understanding with then-leader Jiang Zemin – that Australia’s alliance with America was not negotiable, but nothing Australia would do as a US ally would be directed against China. Occasionally, however, they give us a flick of the whip to keep us in line, sometimes in private and sometimes in public. Julie Bishop received a famous dressing-down from her Chinese counterpart after she condemned Beijing’s declaration of an air defence identification zone in the East China Sea. In March 2017 Premier Li Keqiang warned Australia not to take sides “in a Cold War fashion” after Bishop gave a speech in Singapore which in some ways prefigured the one Turnbull gave in June. We don’t know how Beijing responded to Turnbull’s speech, but it would be surprising if it hadn’t sounded a stern private warning. The Chinese know how susceptible Australian political leaders are to anything that suggests trouble in the relationship, because our leaders keep reminding them of this. Every time they say, “We don’t have to choose between America and China,” they remind Beijing how easily a diplomatic frown from China can create an acute political problem for any Australian government by disproving the mantra on which Australian foreign policy is based. The point has not been lost on Washington. Not long before Obama left office, a senior official vented his frustration to me. “We hate it when your guys keep saying, ‘We don’t have to choose between America and China’! Dammit, you dohave to choose, and it is time you chose us!” US policy-makers have clearly been disappointed by our reluctance to displease Beijing. They have been worried that Australia is being “Finlandised” – slowly slipping into China’s orbit. Washington has mounted a sustained low-key diplomatic effort to counteract this and stiffen Australia’s spine. A steady stream of academics, diplomats and senior military officers has been sent out to remind Australians of how much we should fear China, and to encourage us to lean back towards America. Over the past year or two, Australian policy-makers have become more anxious about China’s power and influence, and less confident that America can handle this without clearer and more tangible Australian support. 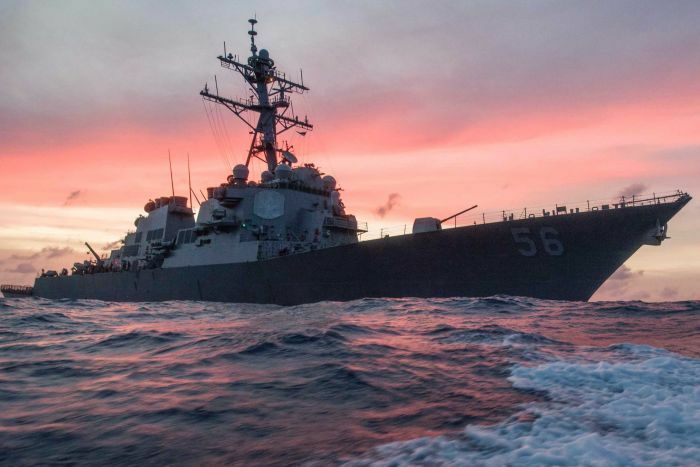 Beijing’s flagrant conduct in the South China Sea has at last convinced many of Canberra’s optimists that China’s challenge to the region’s “rules-based order” – by which they mean the US-led status quo – must be taken more seriously. But it has been China’s conduct inside Australia that has really got people’s attention. Areas of concern include espionage and cyber-infiltration, the vulnerability of major infrastructure, influence over Australia’s Chinese-language press, and surveillance and intimidation of Chinese nationals in Australia, including students. There have been allegations of threats to the academic independence of our universities, of attempts to buy influence over Australian politicians, and of efforts to sway Australian public debate and media coverage about China. These are serious issues which raise important questions about China’s influence in Australia and how we manage it, though discussion about them has, perhaps inevitably, been tinged with populist xenophobia. They have nudged both government and opposition to start raising concerns about China’s growing power more frankly than they have been prepared to do before. At the same time, Donald Trump’s presidency has undermined Canberra’s confidence both in America’s future in Asia, and in Washington’s regard for Australia as an ally. Policy-makers were shocked when it became clear after the election that Trump would be as bad a president as everyone had feared, and that his commitment to Asia could not be taken for granted. Even more shocking was the realisation that Trump cared nothing for the alliance. His abusive first phone call with Malcolm Turnbull soon after the inauguration in January overturned Canberra’s assumptions about how the two countries communicate, and raised real concerns that, for the first time in living memory, the US president simply didn’t care about Australia. Canberra’s instinct has been to try to turn this around. This too has nudged the government to start talking more frankly about China than it ever did in Obama’s time. It seems that Trump has finally made those in Canberra realise how fragile America’s position in Asia is, and so they have now decided to encourage Trump to stand up to China, and to see Australia as a valuable ally in doing this. This explains Malcolm Turnbull’s and Julie Bishop’s more forthright remarks in Singapore earlier this year. It also explains the strange and sad spectacle of the Australian government trying to pretend that Donald Trump is anything like a normal president leading a competent administration. Most significantly, it may explain Turnbull’s extraordinary decision to offer Donald Trump unqualified support in his threats to launch a war against North Korea. Such a war would probably and quickly become the worst the world has seen in many decades, and Donald Trump is the last person in the world to be trusted with a blank cheque on such a matter. The costs to Australia of encouraging Trump to launch such a war, and of joining in ourselves, could be immense. So what now the much-anticipated Foreign Policy White Paper has been released? Despite everything that has happened since 2011 it seems we’re still clinging to the idea that America will remain the dominant power in Asia, that it will be there to shield us from China, and that China can somehow be convinced happily to accept this. So our government has once again failed to come to terms with the full implications of the profound shifts that are transforming our international setting. It is a triumph for wishful thinking over serious policy, and a further confirmation of the systemic failure in political and policy leadership that has afflicted Australia for at least a decade, and arguably since the turn of the century. Of all our recent political leaders, Turnbull did at one time go furthest beyond wishful thinking and seriously discuss these questions, but that was before he became prime minister. Labor in opposition has ventured a little further than the government. Penny Wong, as shadow foreign minister, has spoken quite seriously about our relations with China, but her words suggest that she too assumes that we will face no hard choices, and that America will always be there in Asia for us. It is perhaps understandable that none of our leaders wants to break the bad news, especially when the implications of that news are so unwelcome and unsettling. But until we find leaders with the imagination to see what is happening and the courage to start talking frankly about it, Australia has no chance of adapting effectively to the new Asia into which we are being thrust. And that could well be disastrous for us. RELATED STORY: Where does Australia stand in the battle for dominance between Trump and China? 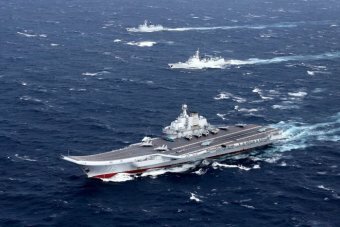 The South China Sea is more than 6,000 kilometres away from Canberra but Beijing's activities in this contested body of water are causing deep anxiety within Australia's defence and diplomatic circles. At its heart, this is a dispute over competing territorial claims but the South China Sea has become a symbol of China's inexorable rise and a shift in the global axis of power. Here's why Australia is concerned and how it's responding to the issue. Who's involved in this dispute? China is the main aggressor. The country claims sovereignty over most of the South China Sea, including a bunch of small land formations, directly challenging the territorial claims of its neighbours — the Philippines, Vietnam, Taiwan and Malaysia. These countries are all keen to exploit the vast fisheries and significant oil reserves that lie beneath. So what's the dispute about? China's motivations are both economic and strategic. 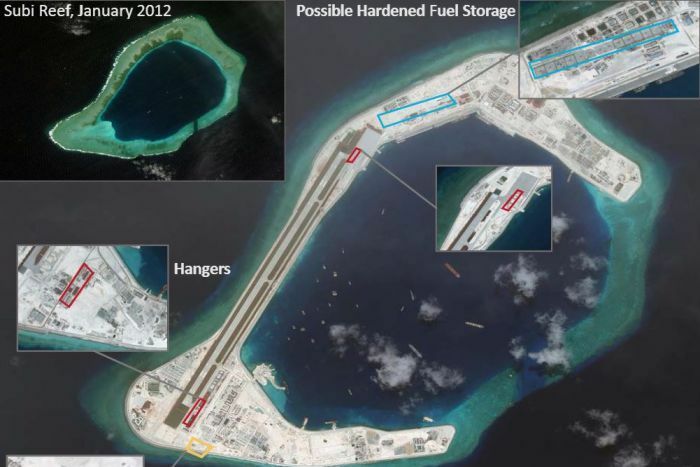 It claims "indisputable sovereignty" over an ambiguous Nine dash-line — basically a U-shaped area which takes in most of the South China Sea — and since 2012, it's been using its considerable naval might to assert control over this area. 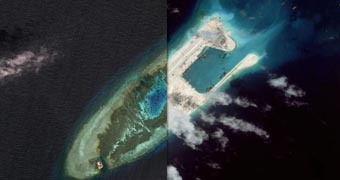 At the same time, China has seized small land formations and installed military bases on artificial islands it's created by dredging 13 square kilometres of land from the ocean floor. It means Beijing can now deploy combat aircraft and missile launchers to the islands at any time. There is serious concern that China's trying to assert control over the area, and project its power throughout the Indo-Pacific region, which is why the United States has got involved. There are two reasons cited by the Government — "freedom of navigation" and "rules-based global order". The South China Sea is one of the world's most important shipping lanes, between $3 trillion and $5 trillion worth of trade passes through the contested waters each year (estimates vary) — including more than half of Australia's coal, iron ore and LNG exports. So Australia has a big interest in keeping that trade route open. The other concern is that China is threatening the "rules based global order," which basically relies on all countries following international laws and resolving territorial disputes peacefully. So, how has Australia responded? Australia is in a tricky position — the United States is our strongest military ally, while China is our biggest trading partner. And both relationships are crucial. While the risk of war between the US and China is considered to be low, it is the source of considerable tension. Ultimately Australia does not want to see the South China Sea militarised and international trade routes compromised. Publicly, Australia has taken a taken a relatively neutral position — refusing to take sides but calling for a "peaceful solution" to the disputes. 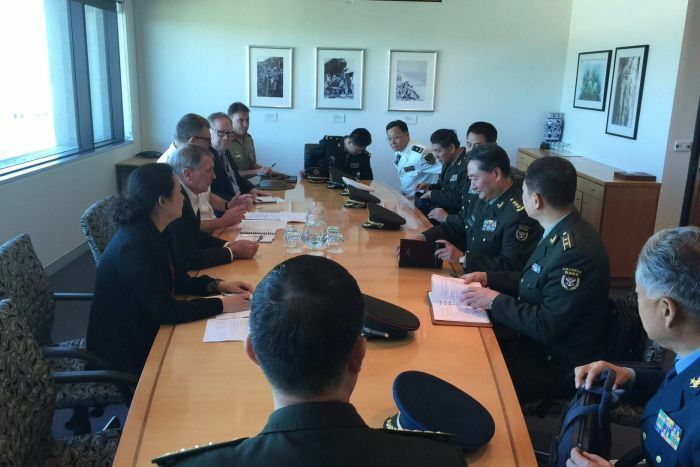 Australia has also been using diplomatic channels and forums to put pressure on China to end its military build-up. On the defence front, RAAF planes regularly conduct surveillance flights and the Australian Navy sails through the contested waters all in the name of freedom of navigation. But don't get these confused with the more provocative Freedom of Navigation Operations (or "FONOPs") the US has been carrying out. What are the US and the Philippines doing? Since 2015, the United States has conducted FONOPs to challenge China's "excessive" claim. These operations, which infuriate China, involve US naval ships sailing within 12 nautical miles of China's artificial islands — sending a message that the US does not recognise them as Chinese territory. It's not about "containing" China, according to the US, but maintaining this "rules based global order". But China does not see it that way. It has told the US to stay out of the dispute, and warned the FONOPs "severely harm China's sovereignty and security". At the recent ASEAN forum, President Donald Trump took a typically unconventional approach, offering to "mediate" between China and the other parties. So far no-one's taken him up on this offer. The other big player was the Philippines, which up until recently, was on the US side of the dispute. Last year, it took China to the UN's Permanent Court of Arbitration, which ruled that Beijing had no historic rights over the South China Sea. But China ignored this ruling, declaring it "neither accepts nor recognises it," and the Philippines has since elected a new president who seems much less interested in pursuing this issue. 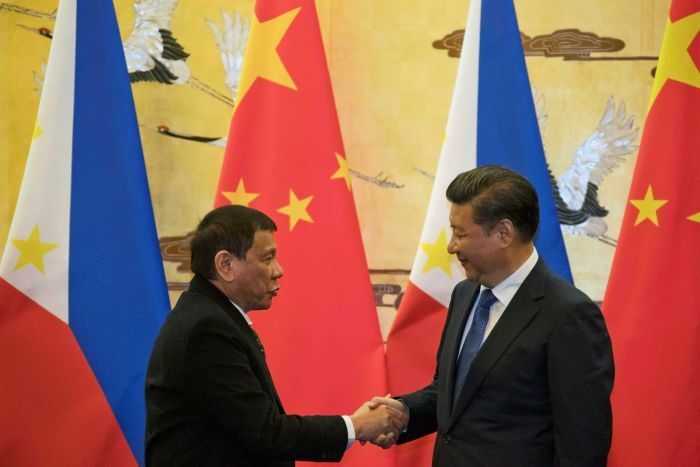 In fact, Rodrigo Duterte has only deepened his country's ties with China, signing multi-billion dollar economic partnerships, and at the ASEAN summit all but confirmed his complete capitulation. "The other hotheads would like us to confront China and the rest of the world for so many issues," he said. "The South China Sea is better left untouched. Nobody can afford to go to war." That is true, but also a sign that old alliances are shifting, further complicating this already complex situation. For now at least, China's slowed down its military build-up in the South China Sea but all eyes are on these contested waters, waiting for its next move.